Last Wednesday/Thursday Calgary got a huge dump of snow. Every year a few times a year the whole city gets hit with a few inches in a short period of time (and yes the drivers go nutso). This time it seemed to snow for a full 24 hours and my estimation was about five or six inches in total! On Friday morning I set out for my long run of the week intending to head up to Nose Hill and trails, but was basically running in ankle deep snow all along the side walks. When I got to the bridge that takes me to the trails I started wading through snow that was over my knees before realizing that the trails were going to look about the same and there wasn’t much point in wading through the snow for 25 km (and also I had a class to get to!). Instead I continued along one of my favourite bike paths that was pretty much totally covered in snow, making the footing challenging but so much fun! It was definitely slow going, although not as bad as I would have thought! I was pretty pumped up by the end of it, whooping and laughing as I went, the dog walkers that were out towards the end of it must have thought I was crazy. 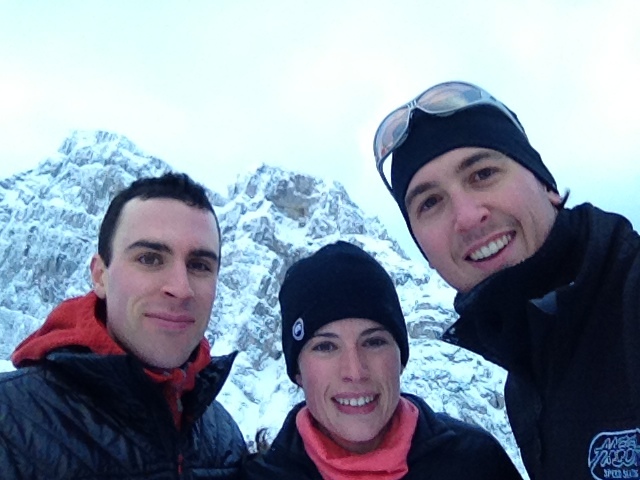 Friday afternoon we headed out to Canmore for a weekend of R & R after several weeks of non-stop socializing. 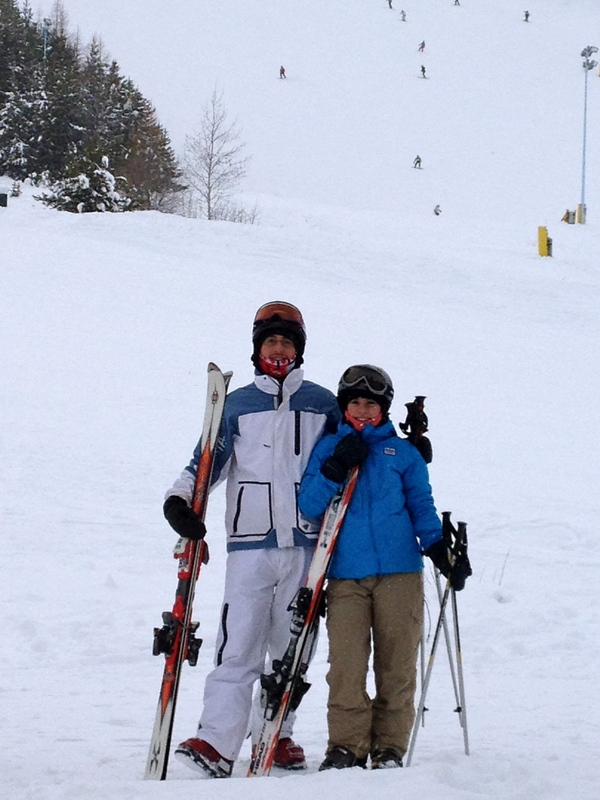 We had an early night on Friday and were up and ready to head out for a long ski on Saturday morning. The plan had been to do between 20-25km on an old road (that is closed) that starts just below Lake Louise and goes out to the Great Divide which is also the Alberta/BC border. There are also a bunch of side trails that loop around off the sides of the ‘road’. 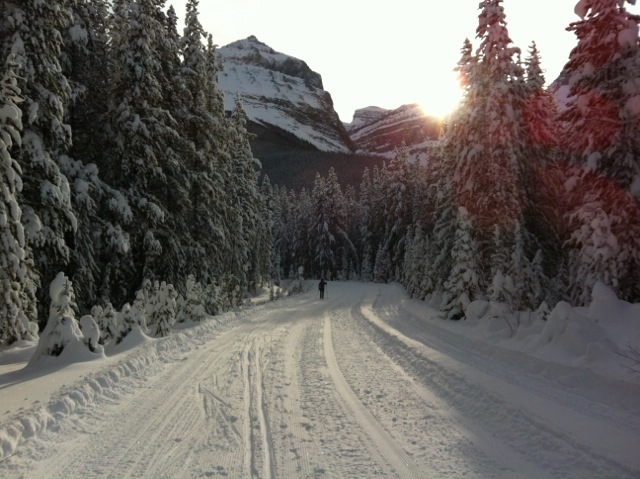 The snow report said that it had been groomed with a double track since the heavy snowfall so we looked forward to fast, groomed trail. Boy were we mistaken. 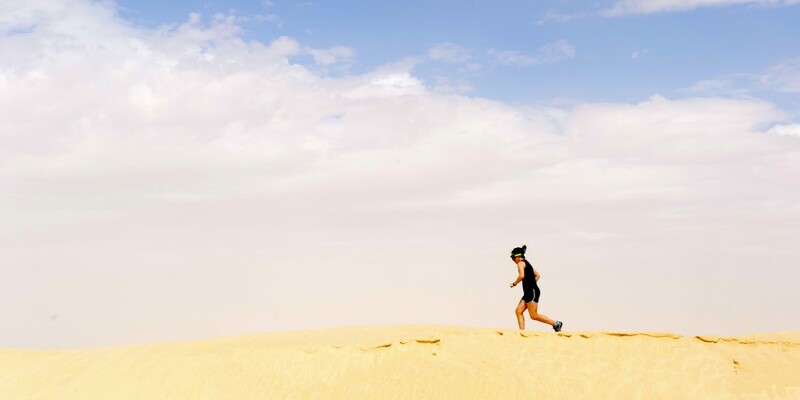 We managed to avoid breaking a sweat the whole time! Probably a combo of the cold and how freakin’ slow we were going! There has been quite the cold snap in the last few days and Saturday was no different. It was probably about -20 (which I know, is nothing compared to the -41 that Yellowknife had this weekend!) but still was pretty cold for me, a soft ‘transplant’. Unfortunately there wasn’t much of a track either. So off we went and were blown away by just how slowly we went! There was absolutely NO glide! Luckily there were some tracks of people who had gone earlier in the day but even those didn’t make much of a difference as we putzed along. To break things up we went on the side trails on the way out and back and managed about 18 kms in 2.5 hours. It was pretty much like walking! It was neat to get to the Great Divide though (I’ve only ever driven over it) and also to the BC border. It was also neat being on a road with a few old signs still hanging around. I guess that it was a chance to re-connect with my northern roots as when I was telling my mum about the experience she replied with “Welcome to my glide-less life”. HA! 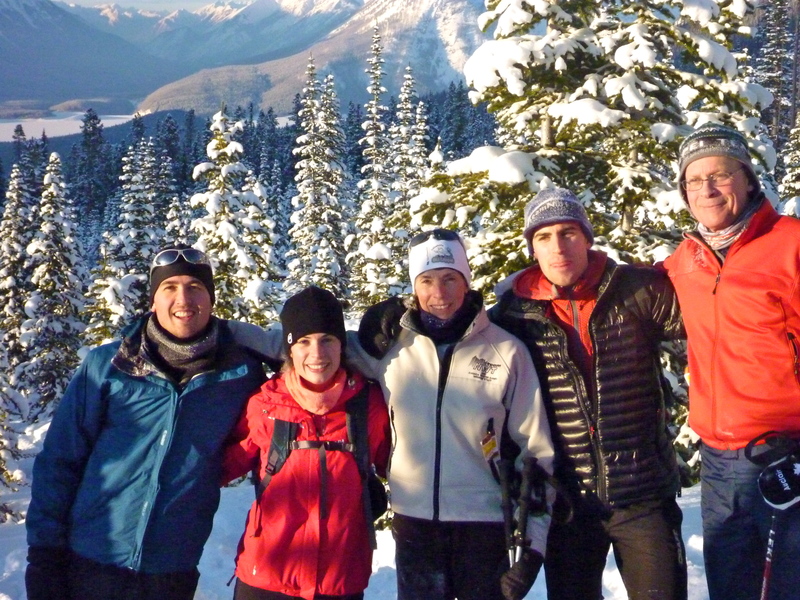 Snowshoeing – with a twist! 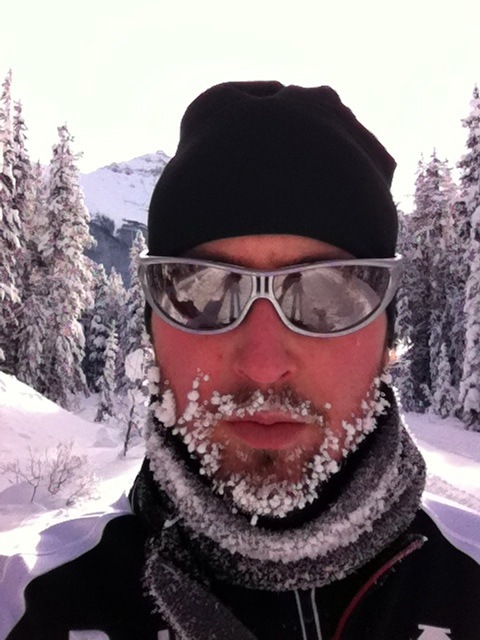 With the Rockies covered with a thick snowy blanket, trail running gets a bit tough. A couple years ago my parents got my brother and I snowshoes for Christmas and I have put them to decent use since! In the week following New Years before school started, Keith’s friend Dan was visiting from Toronto for a few days. 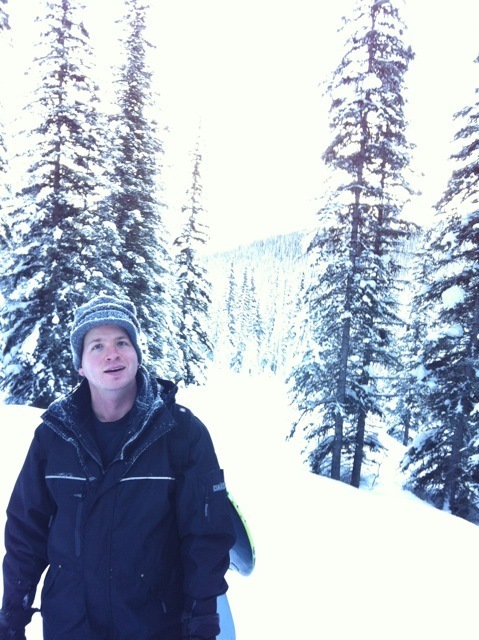 We took advantage of a day off mid week for Keith to get out and explore Blacksmith Ridge (or at least try). I was inspired to pick this one from an awe inspiring photo found on www.bobspirko.com, but unfortunately a reincarnation of that photo was not to be. There were no trails already made so we set out to make our own trail which was both exhausting and slow. We zigged and zagged through suuuper deep snow going up steep ridges (that we basically just had to pull ourselves up using trees) and down again really having no idea if we were going the right way. 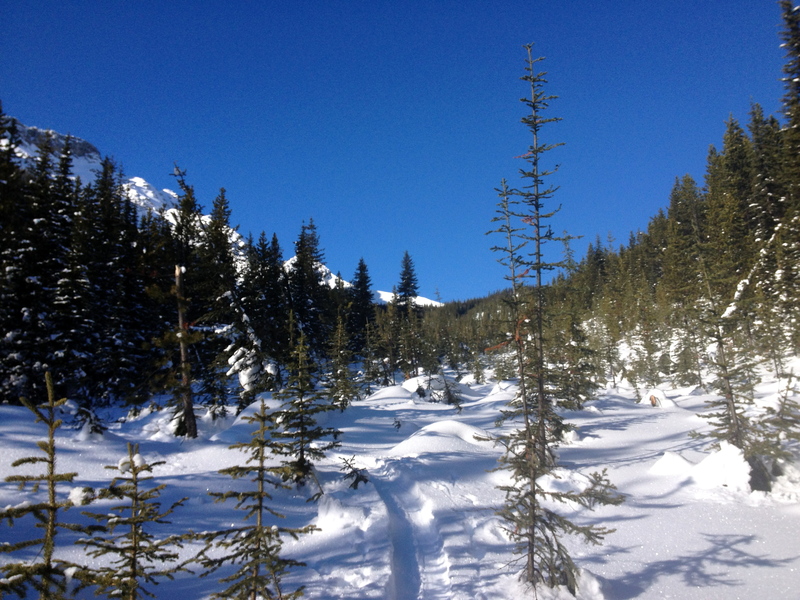 Finally we found some tracks made by back country skiers and followed those up. They didn’t end up where we had wanted to go, and eventually we peeled off their trail following a frozen creek back up a little while before deciding to turn around. It was up that gully that we had the best sledding!!! And it’s way up that way that we were supposed to be headed. Another time I guess! This was where the fun kicked in! 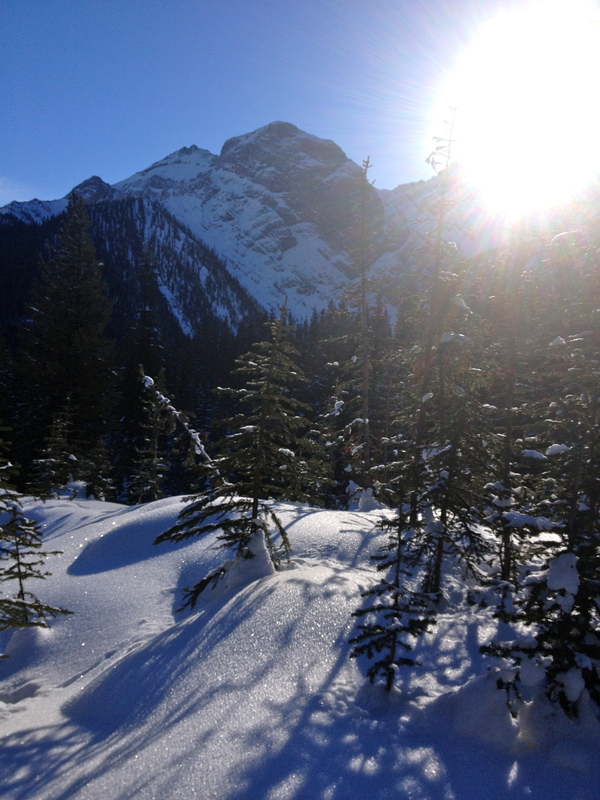 You see, back when we hiked Ha Ling and snowshoed Rummel Lake, there was much talk about how awesome it would be to have flying saucers to go down the hill on! So the night before Dan and Keith had purchased two saucers and a crazy carpet and we had carried them up strapped to our backpacks. 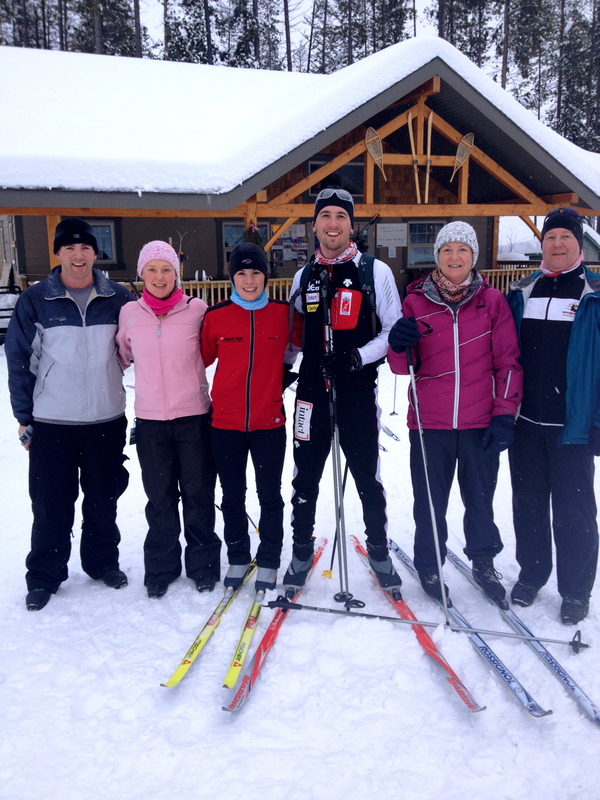 Look out back country skiers and boarders, there are back country toboganners in town! (Yes we got a few weird looks and comments from actual skiers and boarders but I’d like to think they were just a little jealous – haha). While the boys hiked a little further up the gully, I started making a trail down. 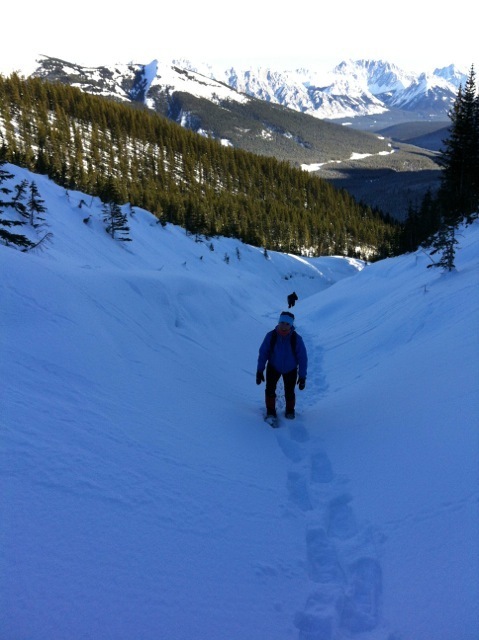 I strapped my snowshoes to my back and let’er fly! Each time I would hike back up to my original starting point and make it a little further down. And it was SO awesome! Soon the boys were flying down too and we managed to get about halfway back to where we started without hiking at all! 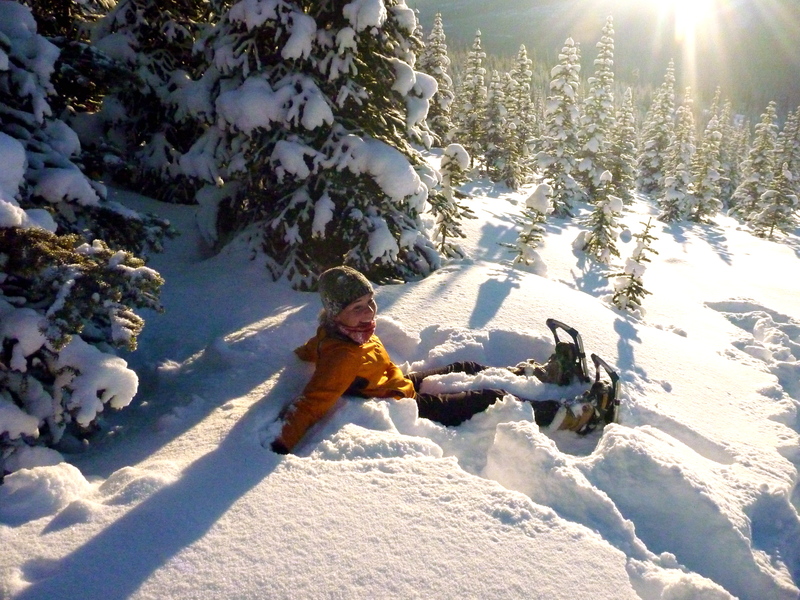 There was so much laughing and many crashes into the deep snowbank but it was totally worth it! We definitely won’t be heading out again without them in the winter! There is simply too much fun to be had! Unfortunately we didn’t get any photos of the actual sledding so you will have to use your imagination, but here are a bunch of photos from the trail. To say that the sun was shining is an understatement! 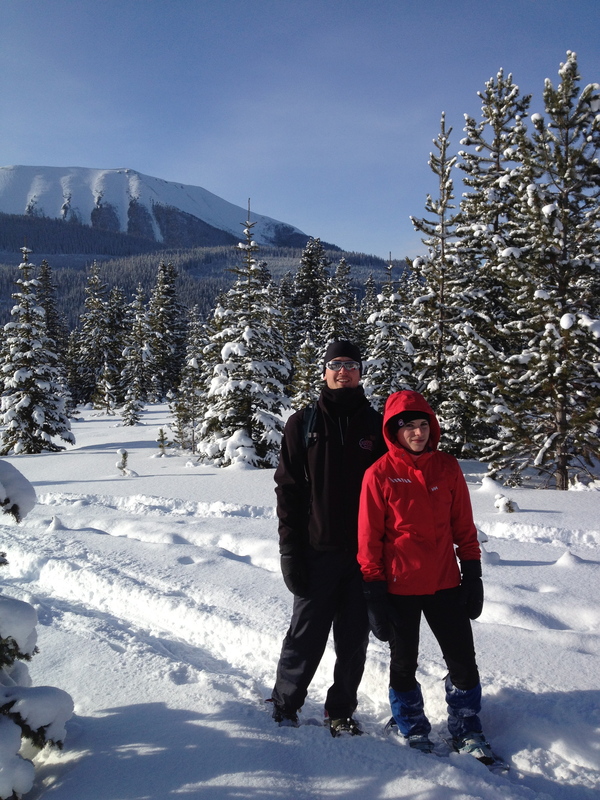 What a gorgeous day in the Spray Valley!!! The most aerobic activity Dan has done in years! We were in the shade of the sides of the creek here. This is where we had the best sliding! Sorry Dan, but this picture is just too priceless! Whew! What a holiday! Somehow I’m finding myself exhausted these days…perhaps a result of all of the fun stuff that I did this holiday! My last exam was on December 17th and after plowing through a bunch of spanish homework, the holidays began with pizza and beer with friends at a super cool little restaurant call HopNBrew. It was a great way to unwind and catch up with some friends before we all blasted off for our respective holidays. My parents arrived on the 20th, followed by my brother late on the 22nd. 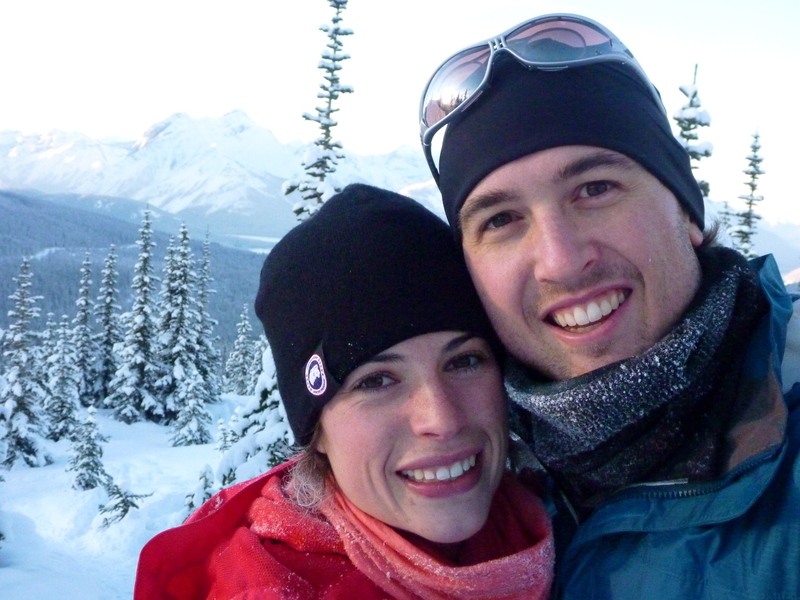 After a bit of a hairy drive out to Canmore in a snowstorm after Michael’s flight was delayed, we arrived just after midnight and hit the hay in order to be ready for a big hike the next day. 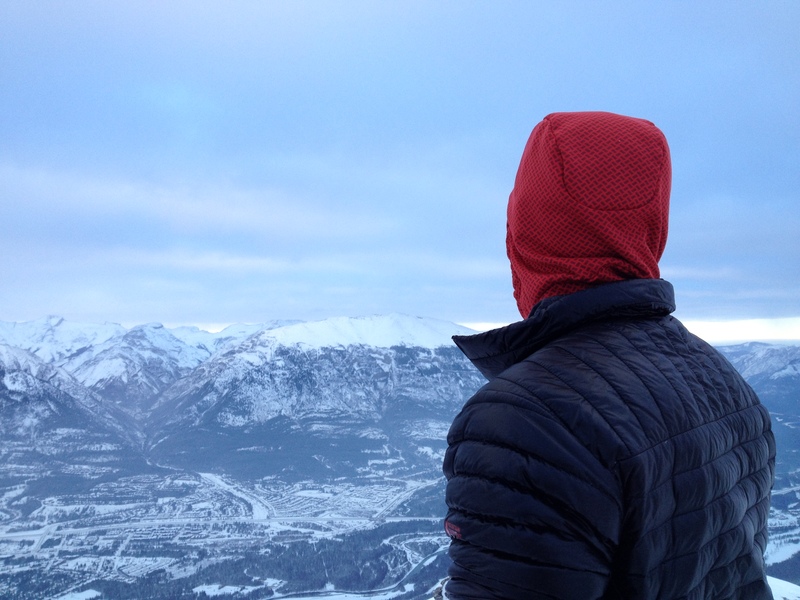 The weather was quite cold, but we piled on the layers and headed out to tackle Ha Ling, a hike that is right on the outskirts of Canmore and the Spray Valley. 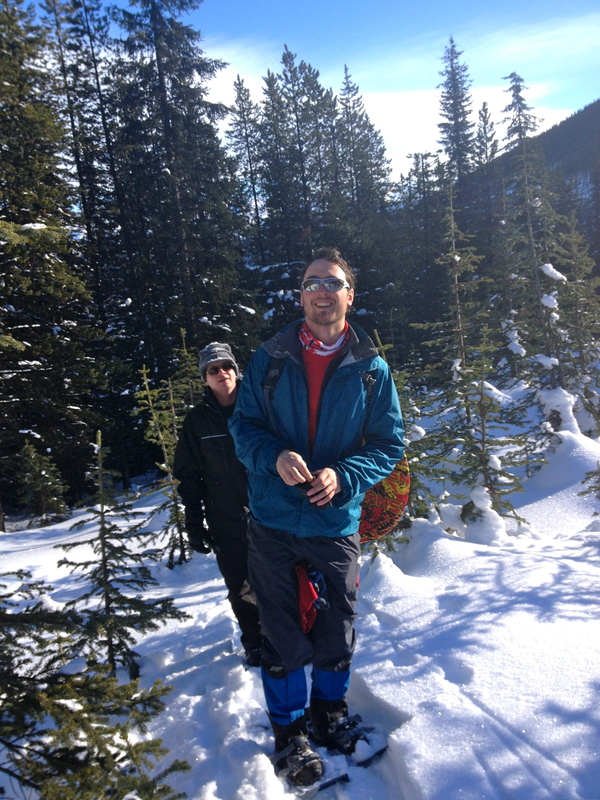 We didn’t take snow shoes because this hike is predominantly tree covered and quite steep. It’s generally not long (in summer it’s probably under 3 hours round trip if you’re quick) but with the snow it slowed us down considerably. Of course we had our trusty trail breakers Michael and Keith who set out ahead while Mum, Dad and I followed up the rear in their tracks. Of course within about ten minutes all those layers that we piled on came piling off…except for Dad who left his parka on and managed to sweat right through it! Mum and dad called it quits just after the treeline where there was only a short scree left to the top, and the boys and I carried on. Instead of peaking Ha Ling, which we’ve done before, we decided to go right instead of left to the peak and check out a different part of the mountain. It was spectacular!!! 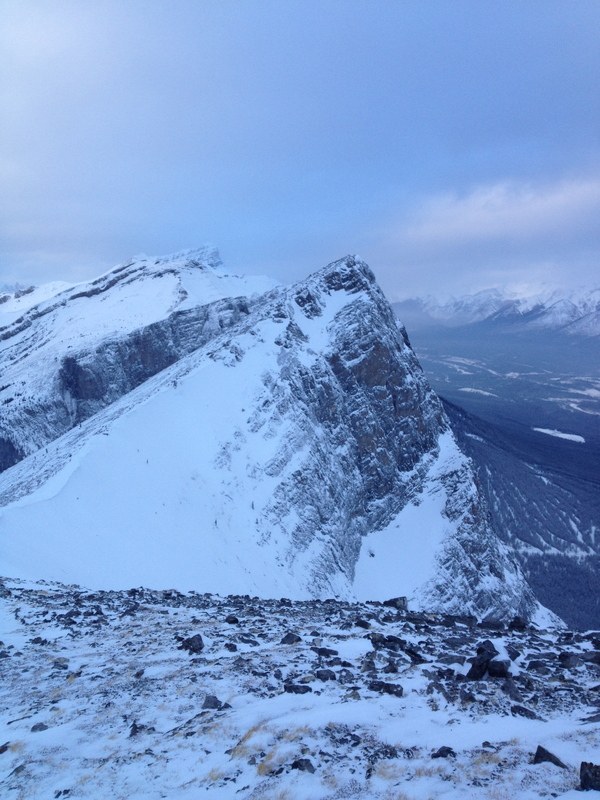 Looking down on snowy Canmore with more mountains in the background is certainly breathtaking! Before we could get cold we started flying back down with the goal of catching mum and dad before the bottom. Of course we couldn’t resist boot skiing on the way down and we made short work of the path…because we kept ditching the switchbacks in favour of sliding down the steep parts in between! It was so much fun, I could barely breath for laughing so hard! Before we knew it we caught my parents when they were on a particularly long switch back. As we were whooping our way down the middle we managed to pass them. Of course they couldn’t resist joining in so on the next good sliding spot we all had a turn! ‘cliffs’ into more snow before heading back out. It was a lot of fun and an absolutely beautiful day. For Christmas Eve we had a family night and had tourtiere (family tradition!) and played Wizard. Last year to Keith’s chagrin he lost in EVERY Wizard game that we played (and I think we played about five times!) but he turned things around this year and I think got second! What a champ! And lucky for us he wasn’t as grumpy as last year about the game (hehe 🙂 ). Christmas morning followed more traditions…first we opened our stockings and then made a feast of a breakfast. Every year for as long as I can remember we have a Stolen made by family friends. The last two years my parents have brought it all the way from Yellowknife. Christmas morning just wouldn’t be the same without it! Along with that we had fruit salad, sausages, bacon and eggs. After a few more seconds then we all needed we hit the tree and once again Santa spoiled us rotten! I am so grateful that not only do I get to spend Christmas with my family in peace and safety, but Santa also spoils us every year. 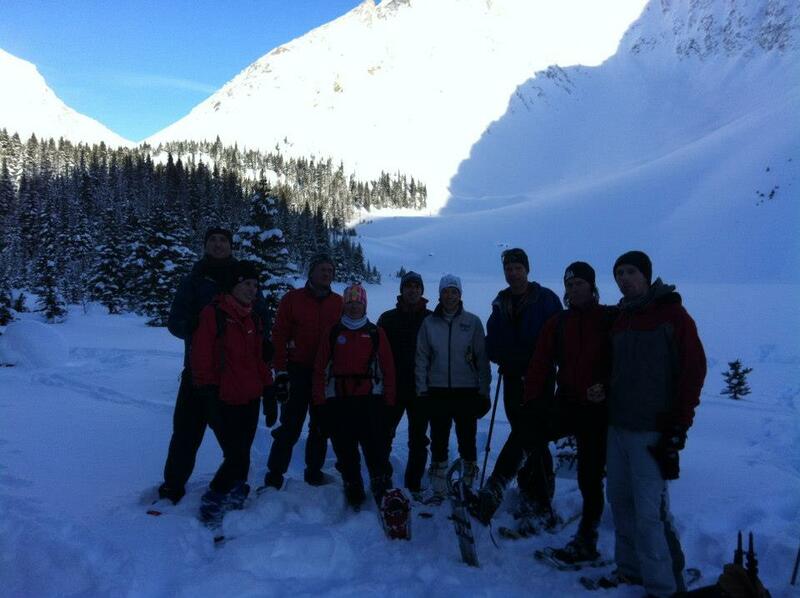 Christmas dinner was spent with the Snowshoeing families which was both scrumptious and hilarious. It was great to reconnect with the kids that we grew up with way back when (and get to know them all grown up!) 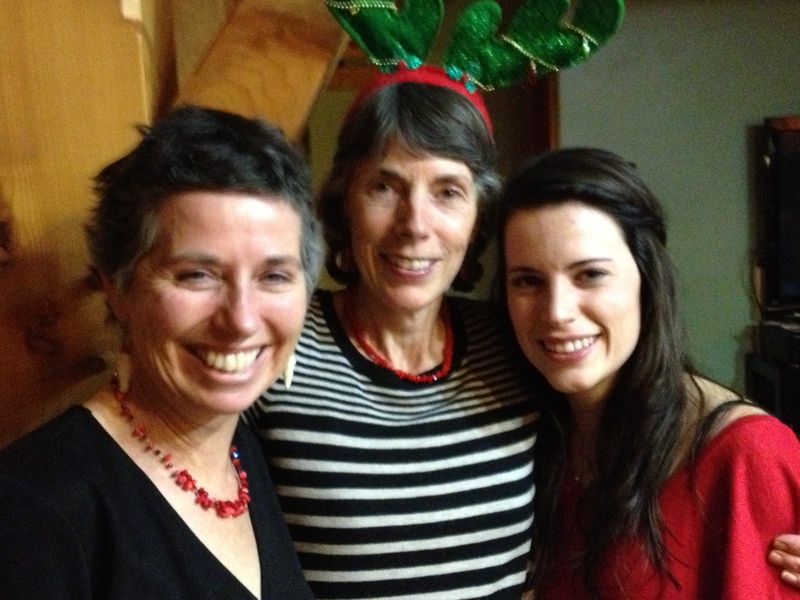 and see our parents (who ‘grew up’ together in the north a million years ago) all back together. Needless to say our kids against parents games got a little crazy (and maybe a little inappropriate – ahem parents!). Hilarious to say the least. On Boxing Day Keith’s family came through for coffee and snacks before taking him off to Kimberley for some downhill skiing. Dad took Michael to the airport so he could get back to training before coming back for one last relaxing evening before I followed to Kimberley on the 27th! Right outside our door on the hill! 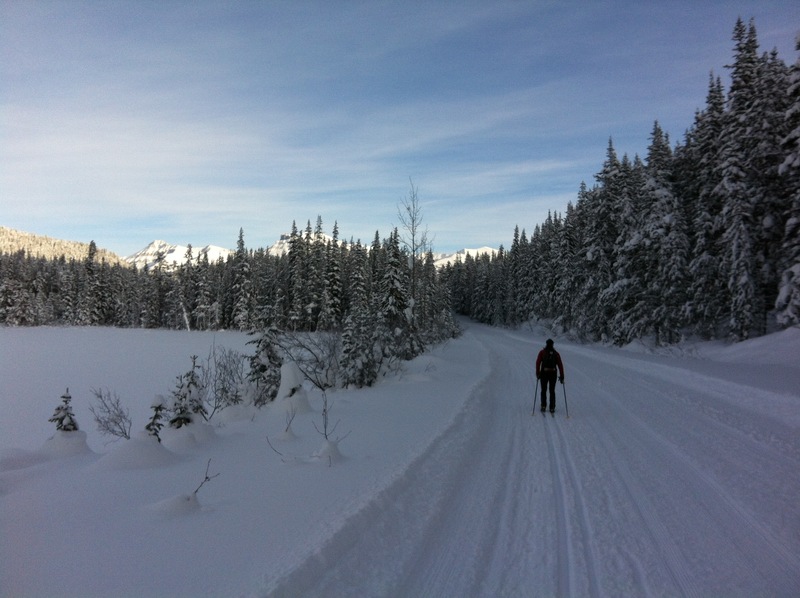 After an uneventful but BEAUTIFUL drive through Banff and Kootenay National Parks, I made it in time for supper and a walk to scope out the cross country trails and ski hill, both of which were RIGHT outside our door. The next morning Keith hit the hills right at nine o’clock while I hit the cross country for a quick ski before joining him on the hill. I have to admit, while I don’t love downhill skiing (I’m a scaredy cat, I get cold easily, and I have trouble wrapping my head around sitting on a chair lift for MORE time than you actually get to ski), I had a fun first day and relished a little fearlessness (which for me is totally relative!). two hours or so. After a quick break at four when the hill closed (which involved a nap in a pond of drool for me) we headed back out with Keith’s dad for another hour and half of night skiing! We were both SO beat that night that we could barely stay awake at dinner! My legs were totally exhausted I can’t even believe looking back that I didn’t crash on those night runs. 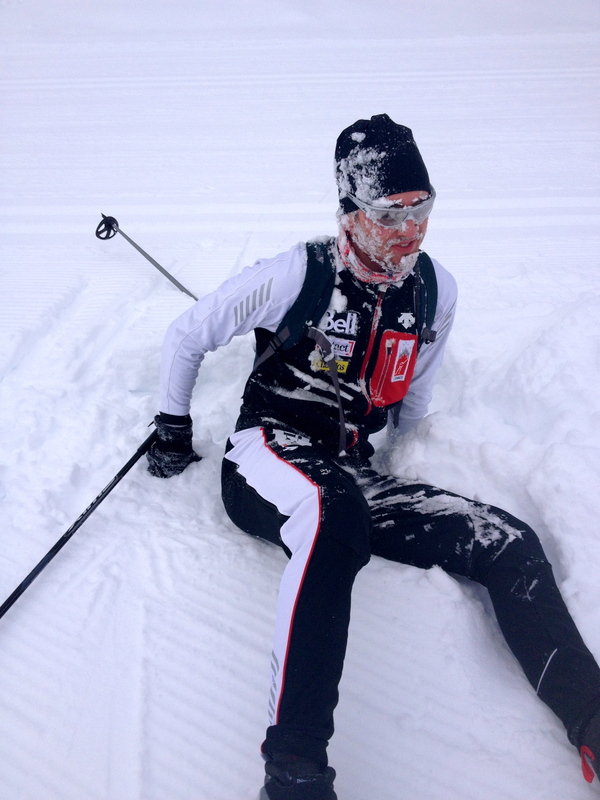 Keith’s worst crash of the week was in cross country…not downhill! the last two runs of the day in order to “get back on the horse” aka get over my fear a bit so that I didn’t end the trip with a bad taste in my mouth. It worked as I had fun on those runs. We capped the trip off with a delicious meal at a German restaurant in Kimberley where we all ate until we were stuffed! It was an awesome holiday, although definitely one that I needed a few days to recover from! 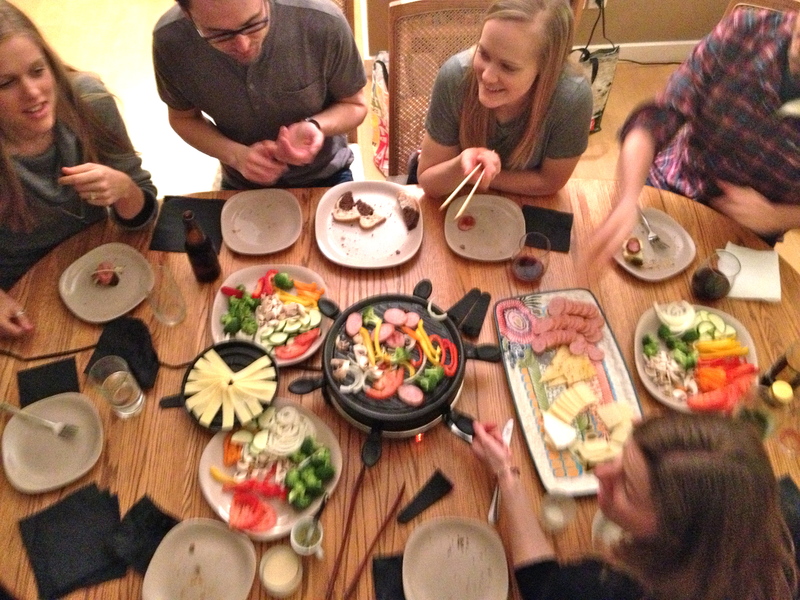 We drove back to Calgary on New Years just in time to host some friends that we had over last year. Unfortunately last year was a bit of a bust as two of the friends (ironically the two that brought cheese and chocolate fondue to share) went home with food poisoning about an hour after they got there (disclaimer…it was DEFINITELY from food they ate before coming over!) So we did New Years take two and thankfully no one went home sick!!! Champagne for our friends Kirsti and Math who got engaged this Christmas!!! 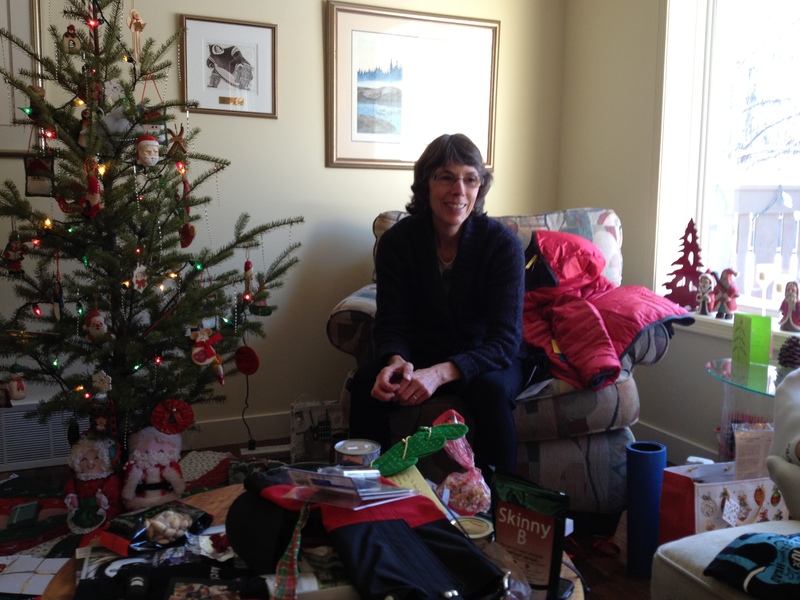 Since then I have been laying low, unpacking, snowshoeing and visiting. Trying to rest up before heading back to school! I guess I realized (what perhaps all adults already know!) that holidays aren’t all that relaxing when you’re organizing, hosting, travelling and cooking! They are certainly fun and filled with friends and laughter, but when all is said and done they take a little bit of time to recover from them!!! 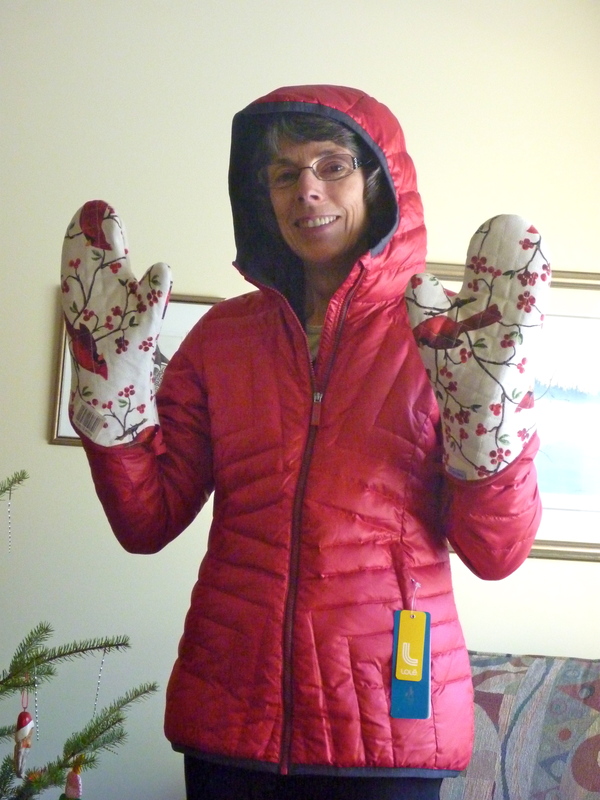 Mum in her new coat and oven mitts! 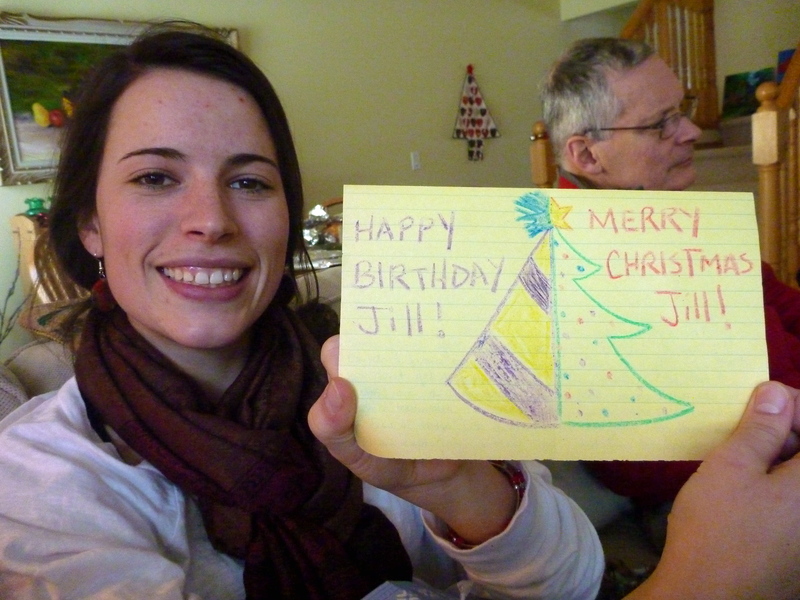 Super creative birthday/Christmas card from my friend Mitchie!!! Sonja chilling in the snow. 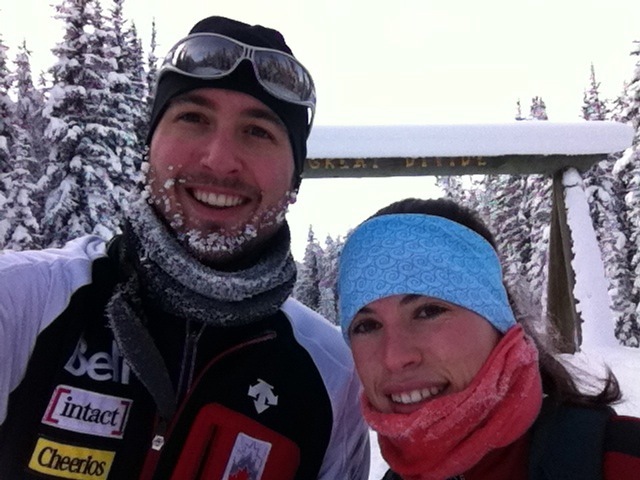 There were a lot of crashes as everyone sprinted through the deep snow! 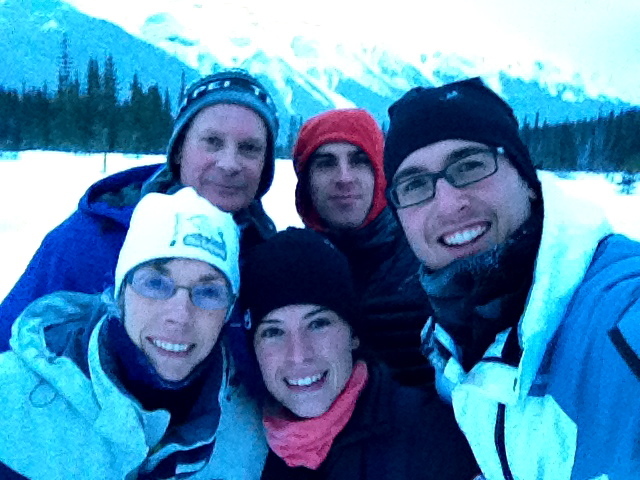 Family photo snowshoeing! 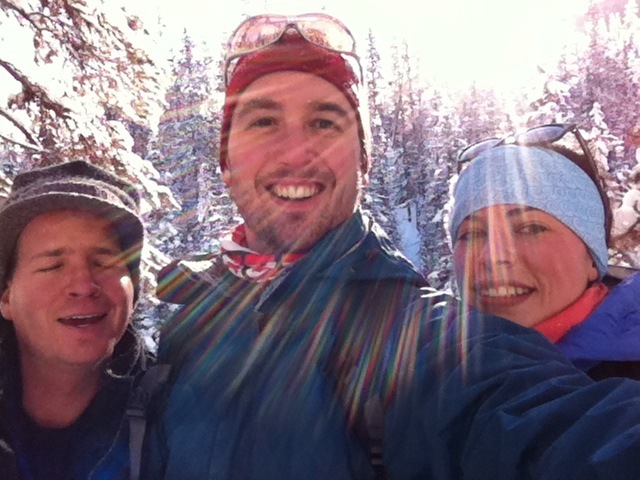 It was incredible…we woke up to a cloudy day but the sun came out right when we got to our starting point! 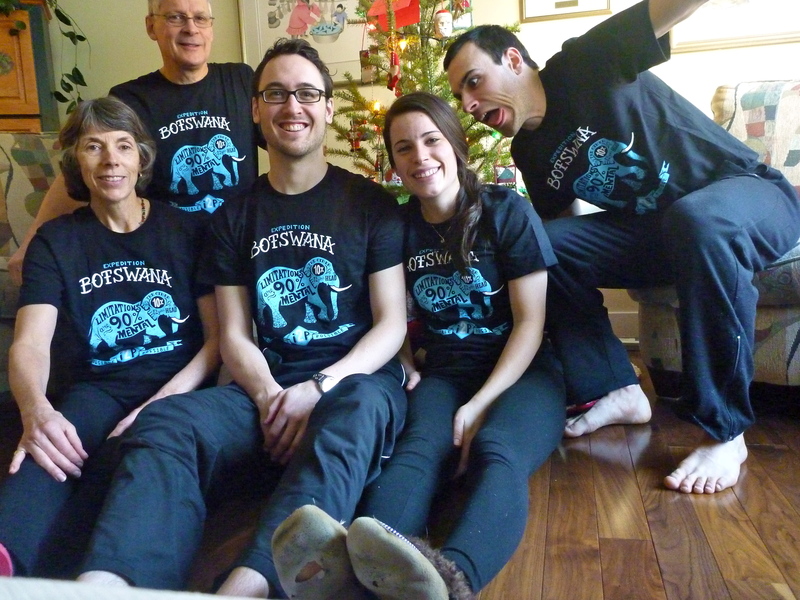 Famjam in their brand new Expedition Botswana t-shirts! Happy New Year everyone! Cheers to 2013 – your best year ever! 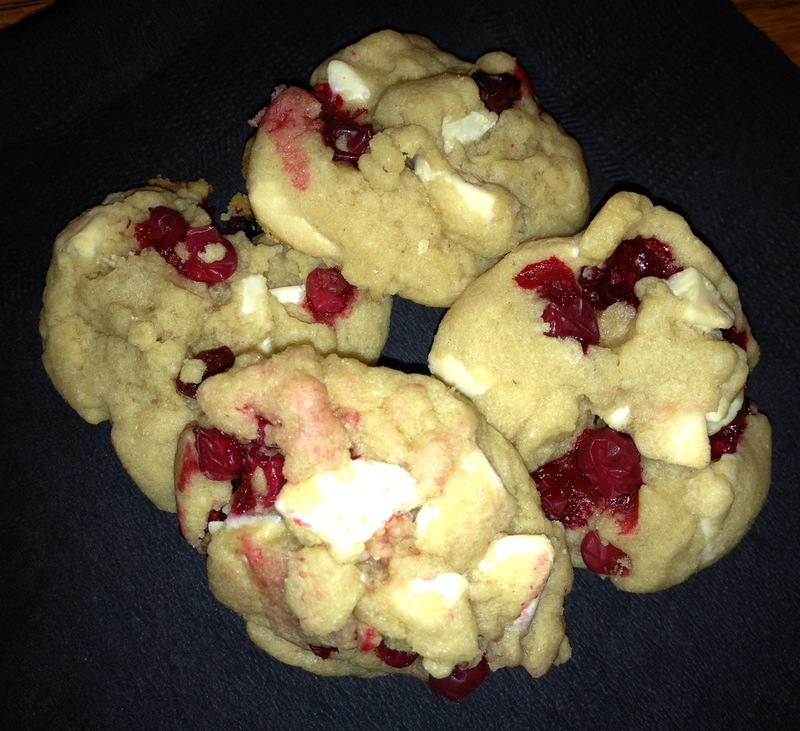 A cookie a day keeps the doctor away: final part! Last Christmas I discovered a secret ingredient. One that takes a chocolate chip cookie from ordinary to extraordinary. It turns out a rich cookie that makes you feel like your eating something much more decadent than a mere cookie. Ok ok I can’t keep this up. It’s rum! Dark rum! I just replaced the vanilla with dark rum! It makes the cookies really sweet and more complex than the vanilla does. Spray a cookie sheet with non-stick spray and pre-heat the oven to 350 celcius. In an electric mixer with the paddle attachment cream the butter and sugars together until fluffy and light. Mix in egg and rum. Combine the flour, cornstarch, baking soda and salt in a small bowl or measuring cup. Slowly add it to the sugar/butter mixture and mix on low. Add cranberries and chocolate and mix by hand until fully combined. At this point you can chill the dough for 30 minutes or up to three days. This will increase the chewy-ness of the cookies. Alternatively you can just drop small balls onto the prepared cookie sheet and bake for 8-9 minutes until barely golden brown around the edges. Resist the urge to leave in for longer if you want to maintain the chewy texture! Let cool on pan for 3-5 minutes before moving to cooling rack to cool completely. 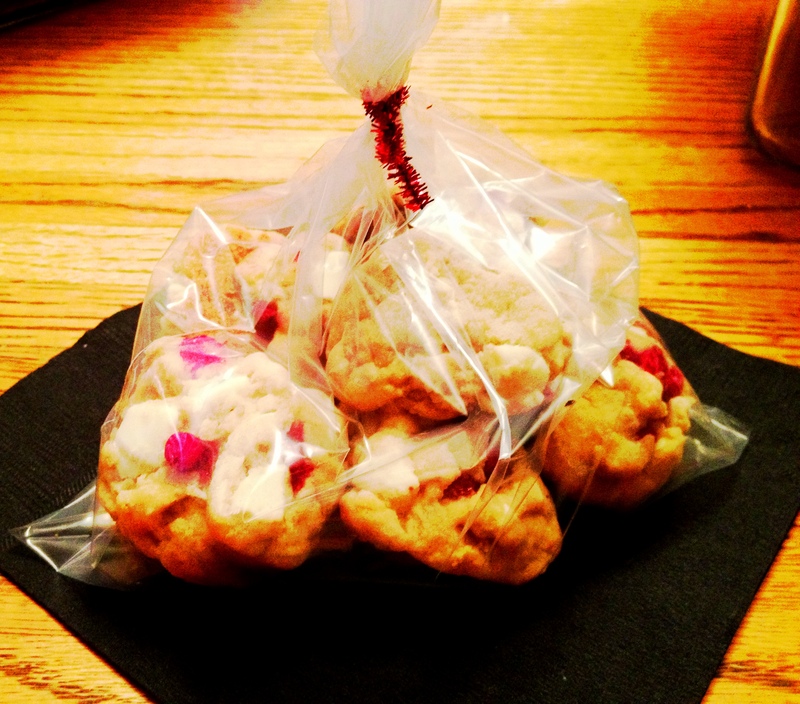 – You can use dried or real cranberries. I use northern cranberries that are nice, small and tangy. If you were using regular fresh or frozen cranberries I suggest cutting them into small pieces. All wrapped and ready to go! I hope that everyone had incredible holidays and did tons of fun things and ate tons of yummy food! I know I sure did! After a break from my computer over the holidays, here is part three of my Cookie a Day Keeps the Doctor Away! Cheers to 2013 being your best year ever!!! 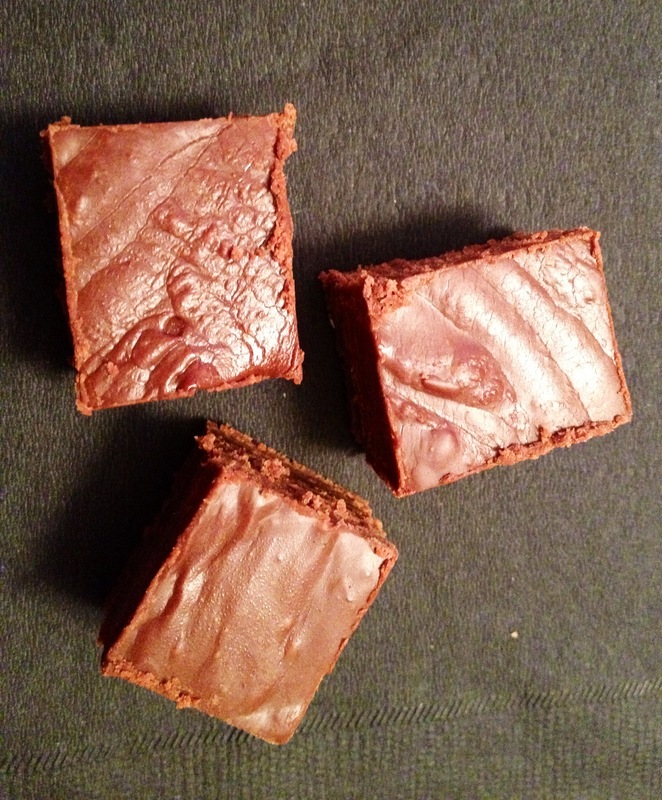 I know what you’re thinking…fudge isn’t foolproof! Nothing is! And it always drives me nuts when I see titles of stuff (be it recipes or whatever else) that say they are foolproof. Somehow it’s always the ‘foolproof’ stuff that I mess up on. BUT I purposely named it that for one reason and one reason only. To make a point that even when something is supposedly foolproof, it’s still ok if you mess up! Just because it’s fool proof for one person doesn’t mean it’s fool proof for someone else! Ok, ok, rant over. On to the recipes! The other day I was perusing recipes and found a fudge recipe that had marshmallows in it. I was amazed! Is that a thing? And how have I missed it?! So I googled it, and sure enough there are hundreds of marshmallow fudge recipes. In all honesty, you can’t taste the marshmallows all that much, they mostly add substance, but I made two recipes and they both turned out great! (Hence the ‘foolproof’). Line an 8 inch pan with parchment paper and spray with non-stick spray. Combine butter, sugar, cream, marshmallows and salt in a heavy pot and cook over medium heat, stirring occasionally for 8-10 minutes or until the marshmallows are melted. Remove from heat and stir in the vanilla and chocolate chips. Continue stirring until completely melted. Pour fudge into the prepared pan and let cool at room temperature for 30 minutes before covering and refrigerating for at least an hour or until set. Remove from fridge and, using the overhanging parchment, pull out the fudge and place onto a cutting board. Cut into small (approximately 1 inch x 1 inch) pieces. Keep refrigerated until serving. Combine the brown and white sugars, butter and cream in a heavy pot over medium heat. Bring the mixture to a boil whisking occasionally. Once boiling reduce heat and let boil for about five minutes. Remove the pot from heat and add the vanilla, icing sugar and stir until combined. Add the mini marshmallows and still until completely melted. Pour into prepared pan and let cool at room temperature for about 30 minutes. Refrigerate for an hour or until completely set. 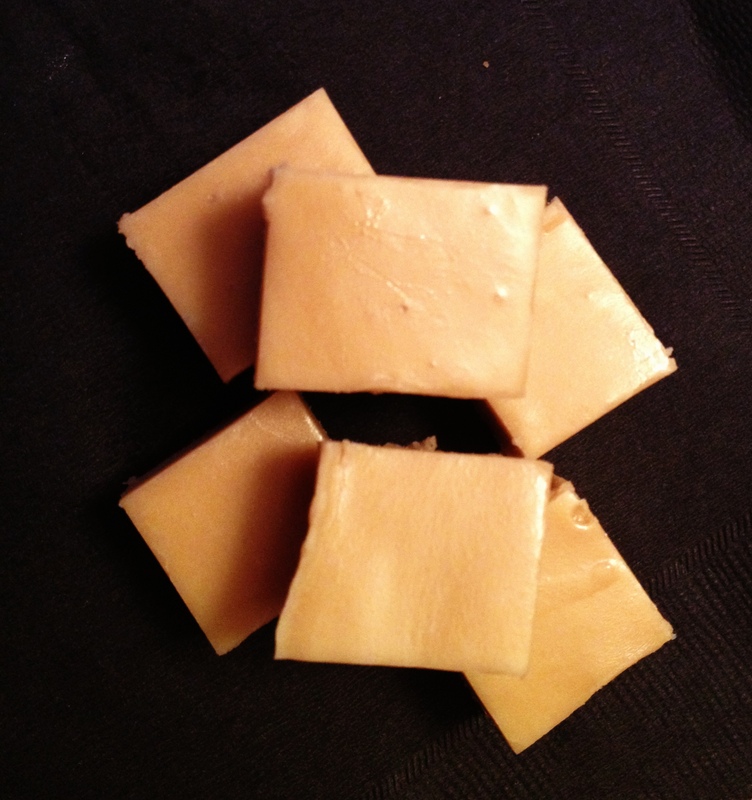 Use parchment to lift fudge from pan and place on a cutting board. Slice using a large knife into approximately 1×1 inch squares. Store in the fridge until serving!